This delightful North American woodland flower is one of the first to bloom in early spring providing much-needed pollen for all types of bees and beneficial insects. 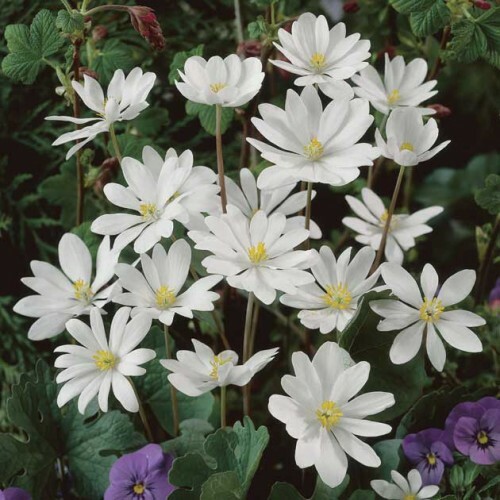 The lush leaves surround the flower stalk of white, star like flowers. They are Ephemeral, meaning they will disappear, in mid-summer and be ready to emerge again next spring. Its flowers open up in sun but close at night. Commonly known as Bloodroot because all parts of the plant exude a bright reddish-orange sap when cut, this native wildflower is best massed in shaded areas of woodland, wildflower, native plant or rock gardens where plants can be left alone and allowed to naturalize. Sap was once used by Native Americans for dyes. It is sometimes included in herb gardens because of medicinal properties.